Last month, I blogged about free hookers. Sort of. But last week, I got two free things that are even better! I know, I know. You're thinking, "But what could be better than free hookers?" I'll tell you, folks - free concert tickets and free movie tickets, to be enjoyed within the span of two days. Prior to this show, I didn't even particularly like Regina Spektor, but, as my concert-going partner said, the show felt "like watching modern art." It was truly one of the more incredible musical experiences I've had the pleasure of enjoying. 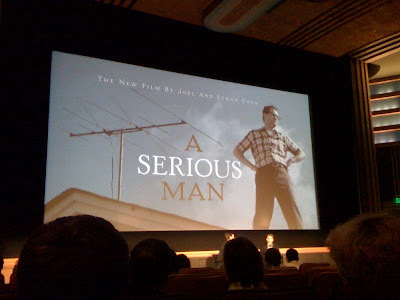 The next day, I attended a sneak preview of Joel & Ethan Coen's new film, "A Serious Man," tickets courtesy of the National Council of Jewish Women. Because I actually walked out of the Coen Bros' "Burn After Reading" (who knew a Brad Pitt/George Clooney flick could be such a snooze? ), my hopes weren't particularly high for this one, either, but I was beyond surprised - pleasantly - by this movie, which was the Jewiest film I've ever seen (& I mean that in an enjoyable way). Afterward, the star of the show, Michael Stuhlbarg, did a Q&A for us, moderated by a smarmy NBC news correspondent who asked inane questions. This week's verdict? I'm so into free things. Everything is exponentially more enjoyable than it would otherwise be when it's free. Where can I get more free things?! I get a few offers and invites from people hoping I'll write them up in Metblogs- free things can be cool if they are things you like. I like how you started and ended this post talking about hookers. What's the colloquial term for selling one's "services" for free things?